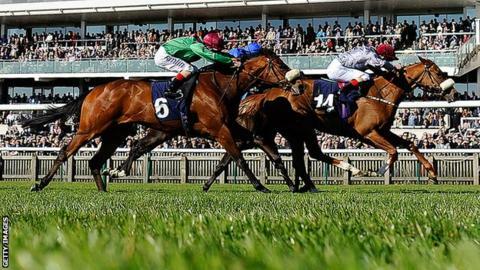 Frankie Dettori won the Nell Gwyn Stakes on 7-2 favourite Sandiva for trainer Richard Fahey on day one of Newmarket's Craven meeting. He guided the filly to a half-length win from Euro Charline for owners Al Shaqab Racing, with Majeyda third. Dettori performed a flying dismount after victory on Sandiva, who was cut to 16-1 from 25s by bookmakers for the 1,000 Guineas at Newmarket on 4 May. The jockey missed most of last year through a drugs ban and later injury. Sandiva, a daughter of Footstepsinthesand - who won the 2,000 Guineas nine years ago - had finished runner-up in the Albany Stakes at Royal Ascot last summer. She stayed on well over seven furlongs at Newmarket to hold the fast-finishing Marco Botti representative Euro Charline, with Godolphin's Majeyda a further short head behind. "She is entitled to go to the Guineas with a good chance," said three-time champion jockey Dettori, 43. Irishman Fahey, who is based in Malton, North Yorkshire, said: "Frankie is sure she will stay a mile and he spent half the race trying to switch her off and get her in." Fahey won the Nell Gwyn in 2011 with Barefoot Lady, another daughter of Footstepsinthesand. Meanwhile, Dettori's old employers Godolphin took the Fielden Stakes with True Story, who is now as low as 10-1 for the Derby at Epsom on 7 June. Silvestre De Sousa steered his Saeed Bin Suroor-trained mount (5-2) to a six-length win over favourite Obliterator. Trainer Richard Hannon, who has taken over the training licence after his father Richard's retirement and saddles Toormore in Thursday's Craven Stakes, celebrated a 67-1 double. Magnus Maximus, won the £100,000 Tattersalls Millions Sprint at 25-1 before 13-8 favourite Shifting Power landed the European Free Handicap by a head from Mushir.